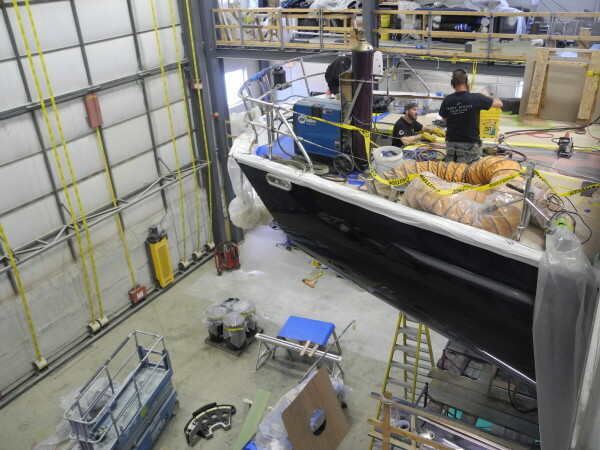 Front Street Shipyard employees work on refitting a yacht in Building 5 in this October 2014 BDN file photo. 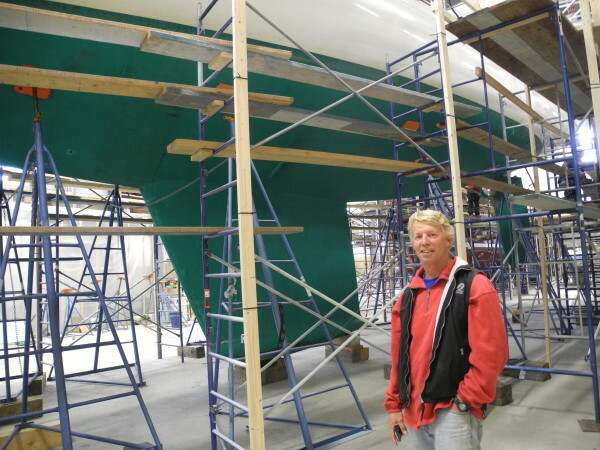 Front Street Shipyard President JB Turner stands in front of one of the yachts being refitted by his company in this September 2013 BDN file photo. BELFAST, Maine — A proposed partnership between Front Street Shipyard and a Norwegian shipbuilding company to build carbon-fiber ferries in Maine could mean as many as 100 new jobs in Belfast. Front Street Shipyard, which employs just over 100 people in downtown Belfast, became introduced to the Norwegian shipbuilding company thanks to Martin Grimnes, a composites industry entrepreneur who lives in Brunswick and who was born in Norway. He also has a special interest in passenger and vehicle ferries. “I got married on Vinalhaven Island. I’ve been traveling on those ferries since 1972,” Grimnes said last week, adding that his wife’s grandfather, Everett Libby, has been referred to as the father of the Maine state ferry service. A ferry named after Libby still plies the cold waters of Penobscot Bay between Rockland and Matinicus Island. The M/V Everett Libby, though, is made of steel — a heavy medium that requires significant maintenance and operating costs, Grimnes said. In comparison, boats built of carbon fiber composites are lighter, noncorrosive, nonrusting and use much less fuel. But those technical improvements have largely skipped over American passenger and vehicle ferries, he said. That may be at least in part because the Jones Act, the federal law that promotes and maintains the American merchant marine, prohibits ships from carrying cargo and passengers from port to port in this country unless the ships were built in America. Brodrene Aa, located on the banks of a fjord in Norway, introduced the world’s first carbon-fiber passenger vessel more than 10 years ago, according to the Front Street Shipyard website. But it cannot sell those ferries directly to customers in the United States, and that is where the new partnership comes in. “Given Front Street Shipyard’s modern facility and boat building capacities, we believe their team can deliver the same high-quality vessels in the United States that we produce in Norway,” Leif Riksheim, board chairman at Brodrene Aa, said. Turner said that the new company initially would concentrate on building passenger ferries for 150 people or fewer. “We’re in the process of figuring out how to do any class of ferry,” he said, adding that larger passenger ferries and ferries that carry vehicles are subject to more stringent U.S. Coast Guard requirements. In Norway, the boat builders need about 13 months to build one of the ferries. Turner said that at least at first, it likely would take his boat builders 15 to 18 months. Grimnes said that the boats likely would be sold for between $5 million and $10 million, and that he has spoken to potential customers already. Grimnes said he has been thinking for decades about how ferries could benefit from composite technology. “When JB started Front Street Shipyard four years ago, we found an entity with the vision and the guts to take on a project that was unique to anywhere,” he said.